For almost 24 years, Shah Rukh Khan has fascinated audiences on the big and small screens with his magnetic charm and undeniable charisma. We at Bollyspice wanted to make his 46th birthday extra special with a full-fledged homage to Bollywood’s favourite romantic hero. Born November 2, 1965 in New Delhi, who knew that he had such great potential ahead of him? He made a few small-scale films and played supporting characters for a short while. He did receive a good amount of limelight in his small roles, such as his movie Deewana in 1992, but it he didn’t strike big until 1993 with Yash Chopra’s Darr, where he stole all the accolades from Sunny Deol, and became the true hero of the film. Baazigar, in 1993, was Shah Rukh’s first movie where he was paired opposite Kajol. This jodi went on to become one of the most beloved pairs in Bollywood to date, and the highest-grossing on-screen couple ever. His popularity continued to rise, not quite topping the other big stars like Aamir Khan and Salman Khan. It wasn’t until Yash Chopra’s son, Aditya Chopra, took a stab at directing and created the longest-running film in history. Dilwale Dulhania Le Jayenge paired him with Kajol once more. The movie that caught the attention of many NRIs (Non-Resident Indians) shot both Shah Rukh and Kajol to super stardom overnight. Shah Rukh’s old villainous image was thrown out the window, and the audiences eagerly embraced his new romantic avatar. 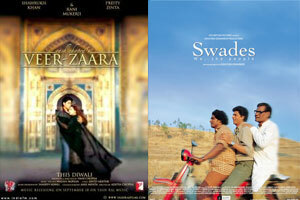 The movie single-handedly brought back pure romantic Bollywood films, and also created a scope for Bollywood viewers outside of India. The years went by, and he continued to give amazing hits to the industry. In 1997 he gave three consecutive hits with Yes Boss, Pardes and then Yash Chopra’s next film, Dil To Pagal Hai. In 1998 he was in three diametrically different films: a comedy with a double role, Duplicate, a romantic love triangle with debutante director Karan Johar, Kuch Kuch Hota Hai, and a more serious art film with renowned director Mani Ratnam, Dil Se. He also took up the role of producer along with long-time friend and co-star Juhi Chawla and director Aziz Mirza. Their company, Dreamz Unlimited, produced their first movie, Phir Bhi Dil Hai Hindustani, starring both Shah Rukh and Juhi. 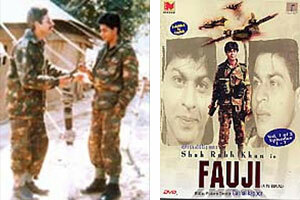 The patriotic film did not fare well, and Shah Rukh began to experience the lowest point in his career. Though, in the same year, he had the superhit Mohabbatein to his credit, many labelled him as an overseas success, rather than an Indian superstar. It was quite obvious that his appeal overseas was substantial. With younger actors, such as Hrithik Roshan entering the fray, Shah Rukh’s days seemed to be numbered. Shah Rukh is not the kind to give up, though. He and Juhi created another production company called Arclightz & Filmz and produced a less commercial film, Asoka, starring Shah Rukh and Kareena Kapoor. Once again, this film flopped and created losses for Shah Rukh, yet his overseas audience remained strong. This strange phenomenon made many producers and directors take notice of the financial opportunities outside of India, and there began to be an influx of movies geared towards NRIs. Today we see there are many movies that do not do as well in India as they do overseas, and marketing overseas has grown to a much larger scale. Shah Rukh’s career starting getting back on track in the latter part of 2001. His good friend Karan Johar decided to direct him in his second venture, Kabhi Khushi Kabhi Gham. This time, the cast was huge, with Amitabh Bachchan, Jaya Bachchan, Kajol, Hrithik Roshan and Kareena Kapoor all being main protagonists. The film did exceptionally well, both overseas and in India, but the masses still questioned whether Shahrukh deserved any credit with such a huge star cast involved. Proving them wrong once and for all, Shah Rukh gave the industry a financial hit and critically acclaimed performance in Sanjay Leela Bhansali’s opus Devdas. It was his only release for the year, but it was also one of very few movies that succeeded in the slow year. Everyone was amazed by the aesthetic and emotional film. But if you thought Shah Rukh’s career had reached its peak, you are mistaken. Devdas was the beginning of the end, and there was no more looking back for Khan as he began to give the industry consecutive hits. In 2003, his production company Dreamz Unlimited came back with the hit Chalte Chalte. Unfortunately, at this time, he found that he had a back injury and needed to have surgery done. Many movies were postponed and scrapped while Shah Rukh took a break from filming for a few months. Thankfully his back recovered, and his career got back on track. 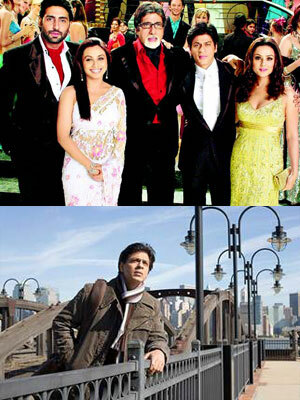 He ended off the year with the modern yet emotional hit Kal Ho Naa Ho. Everyone in the industry wanted to work with the Bollywood Baadshah! He began to rule to roost once again. 2004 marked the debut of choreographer Farah Khan as a director, and she decided to cast her good friend Shah Rukh as the lead. He also worked as the producer of the film under his Red Chillies Entertainment company. The movie Main Hoon Na defied all sorts of conceptions; an action-comedy from a female director. The movie went on to do very well, becoming one of the biggest hits of the year. But there was more success in store for King Khan. Yash Chopra returned to directing after seven long years with the love legend Veer-Zaara, a movie that broke many national records. Shah Rukh, Preity Zinta and Rani Mukherjee glowed under their vast amounts of success. If financial success wasn’t enough, Shahrukh went on to do Ashutosh Gowariker’s Swades and received a great amount of critical acclaim as well, even from his worst detractors. 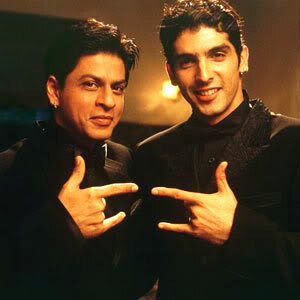 Karan Johar and Shah Rukh Khan co-produced the multi-starrer Kaal, and SRK even appeared in an item number for the movie. In 2005, Shah Rukh’s Paheli, under the Red Chillies production house made a lot of money overseas, and also bagged the honour of being selected as India’s Oscar nomination. In 2006, Shah Rukh collaborated again with close friend Karan Johar for the film Kabhi Alvida Na Kehna, co-starring Rani Mukherjee, Preity Zinta, Abhishek Bachchan and Amitabh Bachchan. The film, which was about extra-marital affairs, created quite the furor and discussion among audiences about the content and message portrayed. Despite the controversy it was a successful venture, especially in the overseas market. Next, Shah Rukh teamed up with well-respected director Farhan Akhtar to remake the classic Amitabh Bachchan-starrer Don. Another controversial move, many critics and fans alike worried that the cult film would be ruined if it were re-imagined with a new actor, but SRK added his own style and substance to the film. 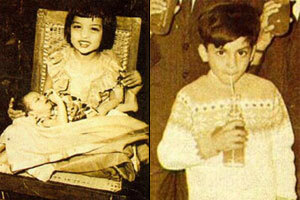 He, along with Priyanka Chopra and Arjun Rampal, had a hit film on their hands. 2007 was one of the most successful years in Shahrukh Khan’s career to date. Firstly, he starred in the sports film Chak De India. It was a risky move, as the film was women-centric, focused on field hockey (not a sport as rabidly popular as cricket) and besides SRK there were no big names in the cast. But word of mouth and a great product led Chak De India to an amazing run at the box office and Shahrukh won every single acting award that year. On the other hand, he tasted great financial success beyond compare with his second Farah Khan film Om Shanti Om, which broke all records overseas and in India when it released on Diwali. His acting chops and his six-pack had fans and critics alike enchanted. It was at this point that SRK slowed down the frequency with which he released films. In 2008, he starred alongside debutante Anushka Sharma in Rab Ne Bana Di Jodi, a film that performed very well at the box office. In 2009 his only release was Billu, a home production from Red Chillies where he was enacting a cameo role rather than the title role, which was in fact essayed by Irrfan Khan. 2010 was an important year for Shah Rukh Khan as he took on his most difficult role yet in My Name Is Khan. In this film he was re-united with favourite heroine Kajol and director Karan Johar. Shahrukh portrayed a man with Asperger syndrome. Upon release, the film received positive reviews from critics and became the highest-grossing Bollywood film of all-time in the overseas market. Khan won his eighth Filmfare Award for Best Actor for his portrayal, thereby joining Dilip Kumar as the record holder in this category. Only last week Shah Rukh released his superhero magnum opus Ra.One, another home production, co-starring Kareena Kapoor and Arjun Rampal, where Shah Rukh plays a superhero. The film boasts of amazing VFX and has been released in 3D. It is making great waves at the box office worldwide. 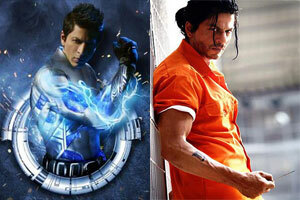 And in less than two months we will be seeing SRK on the big screen once more when he returns in the sequel Don 2. From the most good-hearted hero to the most villainous baddie, he will be giving the audience exactly what they want to see. Exciting times for King Khan’s fans! 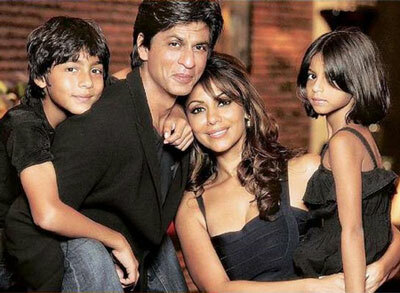 Not only is he a great actor and entertainer, but Shah Rukh Khan is also a family man, with his two kids, Aryan and Suhana, and his wife Gauri. So much is known about Shah Rukh’s family, simply because they are related to the superstar, and they have become celebrities in their own right. Shah Rukh Khan strove to break into the film industry, though he was an outsider. The shock of losing both his parents at a young age motivated him to keep working harder and become the star he is today. Happy 46th Birthday! Hope you keep on entertaining the world for years to come!